In reverse of the usual order, Ene and I kicked off the symposium with an open-ended panel discussion around my concept of ‘deep craft’. We staged the conversation as an old-fashioned town hall meeting and opened the floor to an audience of over 60 participants, encouraging the free exchange of ideas as the Deep Craft concept took shape. Knowing the people of this community around Penobscott Bay would have a lot on their minds, I thought it best to clear the air of any and all preconceptions around the meaning and role of ‘craft’ before introducing the nascent Deep Craft ethos at the core of our work as Wowhaus. The evening took some lively turns, with many salient points made. At one crucial juncture, we were all treated to a lengthy discourse on the history of Craft by Peter Korn, director of the Center for Furniture Craftsmanship, who is writing a book on the subject. Occasionally, the conversation devolved into the (pointless) distinction between art and craft. It was all very instructional to me and provided a unique opportunity to learn how best to position ‘deep craft’ as a new idea, in response to the ongoing controversy surrounding notions of ‘craft’. Towards the end of the panel discussion, John Bielenberg asked if I could wrap things up by saying a few words about the origins of ‘deep craft’ in my thinking. It seemed premature to get too specific because I wanted people to have the opportunity to draw their own conclusions from the dialogue and the remaining symposium, so I ventured only vaguely into how Deep Craft is more of an ethos than a practice. – Drawing on the summation of craft as a communication model as well as a production strategy, Deep Craft seeks to release ‘craft’ from its formal constraints in favor of its underlying value system. 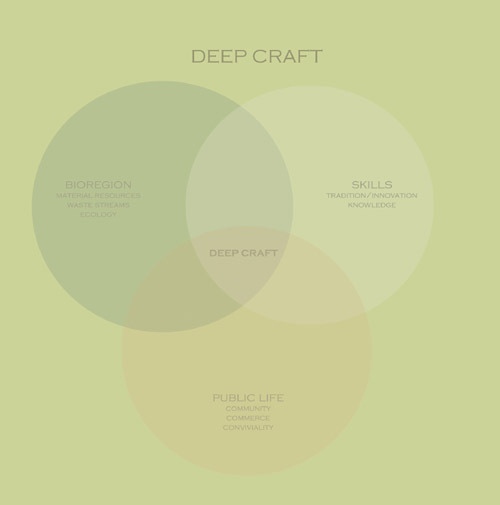 – Deep Craft is an open source system of values that may be applied to making anything. – Deep Craft is not confined to the studio practice of an individual, but is scaleable to a community. – Deep Craft is not the product of individual self-expression or actualization. Rather it is the process of acting as an agent in improving one’s surroundings. While Deep Craft serves self-interest, it is motivated more by an innate desire to do good. The depth of the craft is related to the depth of the improvement. I use the term ‘craft’ to align it with the potential for the hand to act as an agent of change in this process, without the aid of elaborate tools or technologies. Craft can be seen as the summation of human-powered production models throughout history, each with their own political and social histories and implications. Deep Craft draws on these where appropriate as templates to overlay on present conditions, as an ethical standard, but only as such. – Deep Craft is a system of arranging things and relationships in such a way as to improve their value as well as the conditions that sustain the value. Posted by Scott on November 20th, 2008, at 12:01 pm, and filed under aesthetics, all.